It is with great sadness that we report the passing of William H. “Bill” McCracken, aged 92. Bill passed away of heart failure, in Lima, Peru on 7 August after suffering two mini-strokes earlier in the year. Bill McCracken was a legend in the field of refractory raw materials, and was affectionately known as “Bauxite Bill”. He spent a long career at Harbison-Walker Refractories in Pittsburgh and Peru (1947-85), then at F&S International Inc. (1985-98), at the time one of the leading mineral traders specialising in sourcing refractory raw materials. He evaluated refractory raw materials and their potential in more than 40 countries. 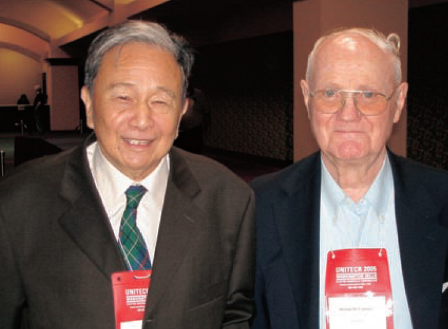 Side by side: two late legends of the refractory raw materials world pictured at UNITECR 2005, Miami: Bill McCracken (right), formerly of Harbison-Walker and F&S International, who passed earlier this month, and Prof. Zhong Xiang Chong (left), of the High Temperature Material Research Institute, Zhengzhou University, Henan, China, who passed away in 2015. His technical knowledge of refractory minerals was extensive, deeply respected across the industry, always sought after, and always generously shared. Naturally, he was very active in participating in industry conferences and contributed many excellent presentations, discussions, and articles to the refractories media. Bill was one of the founders of the Asociacion Latinoamericana de Fabricantes de Refractarios (ALAFAR), serving as its president on various occasions, and a prime force in the establishment of the Unified International Technical Conference on Refractories (UNITECR), with its inaugural conference in Anaheim, California in 1989, and later served two stints as an Executive Board Member. While working in Latin America, he was responsible for establishing a subsidiary of Harbison-Walker – Refractarios Peruanos (REPSA), Peru (now independent) – of which he was its first Managing Director (1953-72). In 2005, REPSA celebrated its 50th Anniversary, marking the occasion with the dedication of its new R&D facility, the William H. McCracken Research Center. Bill was also recognised by the National Society of Industries and the Committee of Glass, Ceramics, Refractories and Related Products (La Sociedad Nacional de Industrias y el Comite de Vidrios, Ceramicas, Refractarions, y Afines) for his long and dedicated contribution to the industry. Bill was the recipient of many awards in recognition of his authority on refractory raw materials, which included: ACerS Fellowship, Distinguished Life Member of UNITECR, American Institute of Mining Engineers (AIME) Legion of Honor, Honorary Life Member of ALAFAR, American Ceramic Society’s Albert Bleininger award (1997), and the 2007 Tredennick Award of The Refractories Institute. Of immense value was Bill’s ability to grasp, understand utterly, and spread the word about the importance of raw materials’ quality and their global sourcing to the refractory end product. As a former Editor of Industrial Minerals magazine (1995-2012) this author can attest to the long-standing and invaluable contribution Bill made to the periodical’s coverage of the refractories market. Back in 1987, Bill was a refractories and refractory mineral rock to me while I was all at sea in my early years as a young Assistant Editor grappling with the intricacies of the refractories business. He always found time to advise and answer my countless questions with exquisite grace, and even in retirement he kindly maintained contact sending news, ideas, and opinions which were forever welcomed and cherished. Notable among the many conversations we had was a running theme about a certain Peruvian andalusite operation which he tipped me off as a “scoop” back in the mid-1990s, but which never seemed to get off the ground, and which served to fuel an Editor’s scepticism. Of course, Bill knew better and kept faith with the project and in the end he was proved right, it finally coming to fruition in 2006 as Andalucita SA and in production by 2009. Such highlights included original work at Magnesita, Brazil leading to their production of dead burned product; pioneering work to develop Chinese refractory mineral sources; his involvement with clays in Iran; magnesia at Fyfield, Australia; and work in chromite in Masinloc, the Philippines, and in Quebec and Newfoundland. Some world class refractory raw material sources are name-checked in that brief insight to some of Bill’s past work. His name and invaluable contribution to the refractories world will be long remembered. Bill received his BS and MS in Mining Engineering from Pennsylvania State University (1944 & 1947, respectively). He saw active duty during WWII as a lieutenant in the US Navy (1944-1946), including the Iwo Jima and Okinawa battles, and then with mine sweeping duties of some of the Japanese islands after the end of the war. Bill is survived by his wife of 57 years, Nora of Lima, Peru, sons William Jr. (Kathleen) of Duluth, GA, Derek (Rosalie) of Pittsburgh, PA, David McCracken (Sandra) of Gillett, PA and daughter Susan Fleming (Bill); and six grandchildren, William, Will, Brandon, Andrew, Michael and Kyle. Link to Funeral Home Family Obituary & online condolences guestbook. Sorry to hear about the passing of Bill McCracken, not only an excellent professional but also a very nice person to talk to. I had the opportunity to meet him a number of times, in UNITECR and ALAFAR events during my career with Magnesita. My memories are of a very energetic and intense person, with a deep understanding of the raw materials importance in our field of work. I’m sure that he left on all of us, who had the priviledge of meeting him, a deep and lasting impression. Although sad news, thanks for posting it and for the extremely accurate note. Independent Consultant, formerly Magnesita Refratarios SA.